The shiploader, supplied by Tenova TAKRAF Italy, was custom designed to meet the client’s requirements. A crucial requirement of the conveyor system component, supplied by Tenova TAKRAF Germany, was modification of the existing conveyor system during operation to reduce production downtime. As a result, shutdown was limited to only four days, minimizing any loss of production. The state-of-the-art high capacity automatic sampling system is also an important feature of the conveying system. Logistics was a challenging consideration, due to the remoteness of the site and the fact that the shiploader was completely assembled in Portugal, after which it was transported to site fully erected using special ocean cargo shipping. In addition, the potential risk of dust due to fine ore material being handled and the strong winds endemic in the region, required strict focus on dust control, with the systems having proven highly effective since installation. Open pit mining and underground solutions provider Tenova TAKRAF, has completed the supply and installation of a 10,000tph (tonnes per hour) shiploader for the Port of Nouadhibou in Mauritania, as part of a contract awarded by Société Nationale Industrielle et Minière (SNIM), which also covers the associated conveying system. Tenova TAKRAF is part of the global total technology solutions provider,Tenova Mining & Minerals. 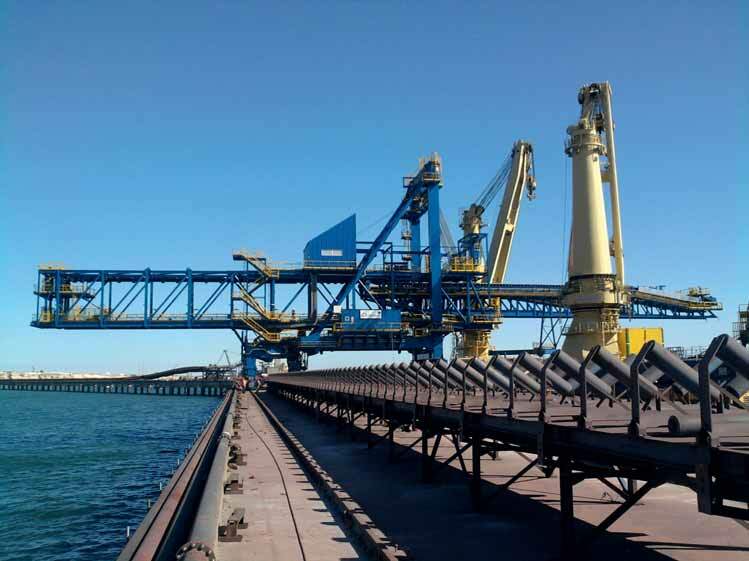 The contract is part of an expansion to the existing iron ore stocking and loading facility at the port and was the first contract that Tenova TAKRAF had received from SNIM. It was also the company’s first project in Mauritania. Since the contract was awarded,Tenova TAKRAF has received a further contract from SNIM for mobile overburden stacking bridges. The contract, commencing in June 2010 and with completion of the entire plant due for by December 2014, covers the design, supply, transport and on-site installation of a travelling, luffing and shuttling shiploader and the complete conveying system. The latter includes transfer towers, a sampling tower, belt scales, dust suppression and metal detection and extraction systems, as well as modification of the existing conveyor system. commitment to uplift the communities and industries in the countries in which it carries out contracts, a local company was used for construction, with supervision and logistical support provided by both Tenova TAKRAF offices in Italy and Germany. A global procurement strategy was used to optimize cost effectiveness, without compromising high quality standards synonymous with Tenova TAKRAF.